Your First Meeting : iBelong! Meeting a new person can be scary. You do not know much about this person. They do not know much about you. It takes time to feel comfortable with someone new. But meeting new people does not have to be hard. It can be fun. This section will give you some ideas to help you when meeting people for the first time. Lisa is a friendly young woman. But she finds conversations hard. People do not always understand her at first. Lisa is very good at playing card games. She learned from her brothers and sister when she was growing up. She also enjoys running and swimming and watching movies. People do not need to talk much when doing these things. When Lisa meets a new friend, she suggests they do one of these things. They have fun together and get to know each other better without much talking. The video and story below are about meeting new people. In the video some people in France speak about meeting new friends. “Be open!” says one man. “I used to be shy, but why be shy?” The video is in French but it has English subtitles. Click on the “cc” below the video if you cannot see them. 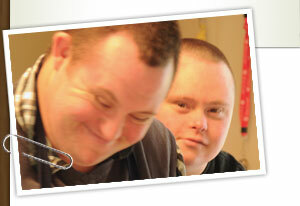 Members of L’Arche in France talk about friendships. Jean-Claude says that it is important to be open. “Why be shy?” he asks. This game will help you think about things to remember when you are meeting a friend. Click on the “Start Prezi” button in the middle of the game. Click on the box in the far right corner under the game if you want full screen. Move through the game by clicking on the arrow in the centre of the toolbar. Answer questions by clicking on the screen. Then click on the arrow. When you finish the game, press the ESC key on your keyboard to exit Full-screen. Go to the next part of the website. You will see a list of conversation suggestions for first meetings. Try practising these conversations. Do this before meeting new people. This will help you feel more comfortable.